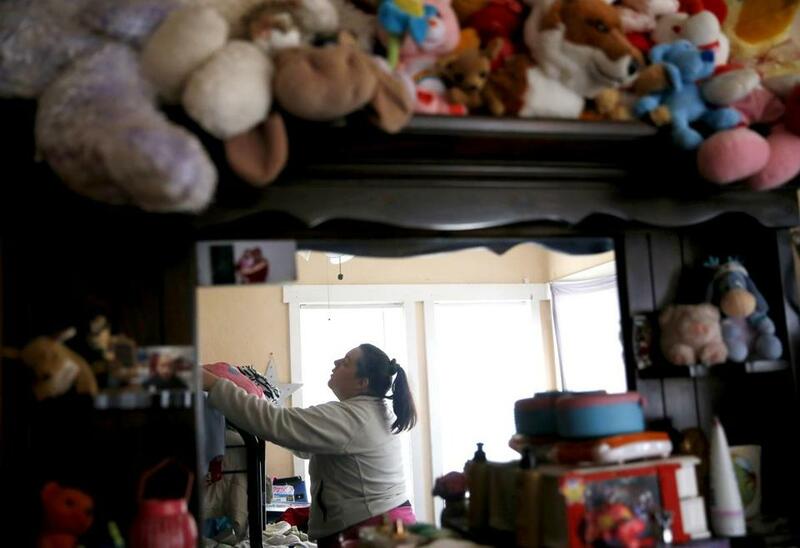 Cynthia cleaned her children’s room before a visit from a Department of Children and Families worker at her home. Cynthia woke early in her small apartment north of Boston. She focused on her preparations for the day, brushing her brown hair and gathering up the backpacks she and her mother had purchased for her children. She set aside the weight of what the day might mean: that this might be the last time she would see her oldest daughter. Cynthia was 35 years old that day last summer, and poor, a victim, she said, of domestic violence, first as a child and then as an adult. She was born with a disability, a rare case of missing genetic material known as a 7Q deletion, which was diagnosed only in adulthood. It caused learning problems and probably her hearing loss. Still, she managed to get by. She was a reliable, five-year employee at a discount grocery store. She had never abused drugs, she said, and never been arrested. She dreamed of owning a home. Most important to her, she was the proud mother of six children. Pictures of them filled her cellphone and adorned her Facebook page. But she has not lived with them or taken care of them in years. The loss defined her, and reshaped her life. It was a choice made for her, and for them — a choice the state makes with some regularity, and with emotional reverberations imperceptible except to those whose lives are forever changed. Since 2013, when the Department of Children and Families opened a case on her family, Cynthia has lived her life under observation, her capacity to care for her children continuously scrutinized by state caseworkers. For most of those five years, she was judged deficient — particularly for her failure to avoid a man the state considered dangerous. Her children lived in three different foster homes. She saw and held and spoke to them only at supervised visits, two hours at a time, in a sparsely furnished room in a sterile office building. Now, as the last warmth of summer slipped away in August 2018, her last grasp on motherhood was slipping, too. Three months earlier, at the end of May, a judge had stripped Cynthia’s legal rights to all but one of her children, at the state’s request, clearing the way for other families to adopt them. She appealed, but to little effect. Though the judge has yet to file a detailed explanation of the decision, as required by law, and no date has yet been set for the appeal, the state made it clear, said Cynthia, that her visits with her five oldest children would soon end. She still retained her rights to the youngest, for now. But the state’s goal for that child, too, was adoption. She did not dwell on that disturbing prospect as she finished getting ready. Instead, she felt heartened by the day, and the unexpected visit with her oldest daughter, scheduled because the grade-schooler kept asking for her. Her dim apartment was cramped but orderly, her groceries shelved and her kitchen table clear. Better housekeeping was among the things the state had asked of her in recent years. Did she deserve to lose her children, all of them, forever? Once upon a time, 25 years ago, Cynthia was taken from her mother. She was 11, and her family had just been evicted. They moved into a motel room on Route 1. Then a caseworker showed up, she says, acting on an erroneous tip that they were living in a car. Cynthia was driven to a foster home in Swampscott. She sneaked out of the house and found a pay phone. Then, remarkably, her mother did just that. Their separation lasted just a week or so. But Cynthia never forgot how lonely and powerless it had made her feel. Now that her own children had been gone so long, almost five years, she knew some people thought she should let go, grieve her loss and set them free to find new homes. That was what some parents did, but she could not. She loved them and she needed to believe her love meant something. She drove down Route 1 to the DCF office in Chelsea. The parking lot was full as always, so she parked across the street at the Market Basket. She slung the backpacks over one bare arm — back-to-school supplies for the children’s first days of school — and jogged across the busy road in her pale pink flip-flops. She hoped the caseworker who came with her daughter today would take the other backpacks to her other children. Cynthia had made mistakes, she knew, and she had tried to correct them. But the biggest, the one the state could not abide, had been finding the wrong father for her children. Cynthia was 24 when she first got pregnant. The baby’s father initially denied the child was his. Cynthia’s own father kicked her out of the house, according to Cynthia and her mother. A phone call to Cynthia’s father was not returned. Efforts to reach the baby’s father by phone and at several past addresses were unsuccessful. The Globe is not publishing Cynthia’s last name to protect the identities of her children. Cynthia was homeless, staying in a family shelter, when she had the child in 2007. Life was hard, but her daughter gave her purpose. She got a housing voucher and found an apartment. She started working at a North Shore homeless shelter. The baby’s father showed up off and on, and Cynthia had two more children with him, both sons, in 2009 and 2010. Cynthia says their relationship was unhealthy from the start. He had a mental illness, according to state reports, which do not specify a diagnosis. Cynthia says the diagnosis varied over time, and that he was unpredictable when he didn’t take his medication. He hit her, according to Cynthia and court and state records. She tolerated it, some of the time, and now thinks the physical abuse she suffered in her childhood made it seem to her acceptable. Both their sons had medical problems, compounding the stress on the couple. During one hospital stay, Cynthia says, her children’s father screamed at a nurse. DCF was notified and opened a case. She says it was closed the following year, when they split up. Three years without state involvement followed. Cynthia moved to a bigger apartment and found work at the discount grocery. She got back together with her ex, drawn to what was familiar, and choosing to believe that things would be different. She leaned on her mother for help with child care and moral support. The older woman worked two jobs but loved her grandchildren. Then, in 2013, trouble came to stay. Cynthia’s oldest daughter started first grade. The school became concerned about her occasional incontinence. One autumn night when Cynthia came home from work, the little girl showed her a cut on her finger. She told her mother it was from a notebook, but at school, Cynthia says, she told her teacher her dad had smacked her with it. He did not cooperate when the school asked questions, Cynthia says. She assumes the school notified DCF, as it must when abuse of a child is suspected. The department began an investigation. On a sunny afternoon in January 2014, the 6-year-old failed to appear at her after-school program. Cynthia was frantic, searching for her daughter, until she got a call from a DCF caseworker. “We have your children,” said the woman on the phone. 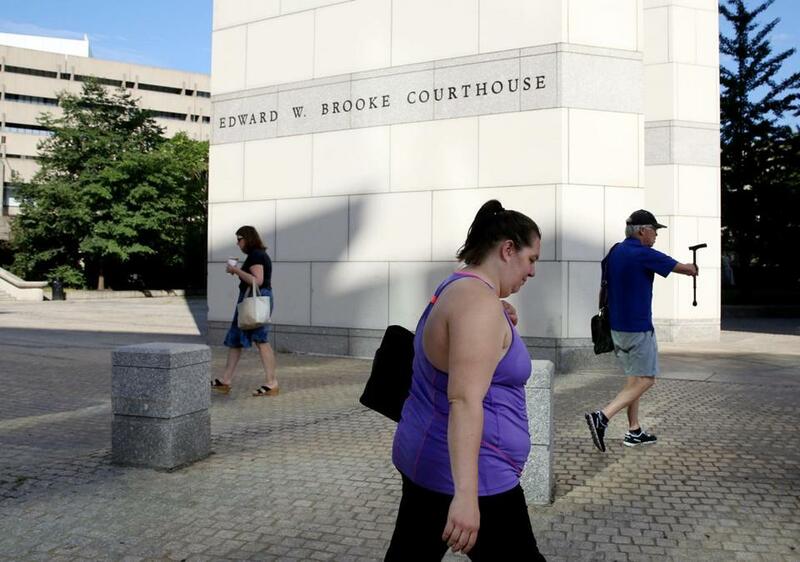 Eventually, DCF officials told Cynthia they had interviewed the three children and had reason to believe their father had sexually abused them, an allegation cited in later state reports that Cynthia shared with the Globe. The reports, from 2016, 2017, and 2018, also mention other concerns — his untreated mental illness, alleged domestic violence in the home, and Cynthia’s own failures to keep a clean house and set limits for her children. But the alleged sexual abuse was the most serious. Cynthia says she was appalled when a social worker first called to tell her about it, and skeptical too. The state had not investigated its suspicions fully until her children were already in foster care, she said; in her desperation for an answer that made sense to her, she wondered if the children’s statements could have been misunderstood, and it was a foster parent who’d hurt them instead. And, she wondered, if the state was sure of its claim, why the children’s father had not been charged with anything. Her denial was a response not uncommon among mothers caught in similar nightmares. But the persistence of her doubt — and the fact that in the months and years to come, she would allow the children’s father back into her life — would ultimately prove her downfall. In meetings that began in 2014 and soon became routine, her caseworkers were clear: To get her children back, she had to be done with him, once and for all. The stakes were as high as they could get. And the margin for error was perilously thin. 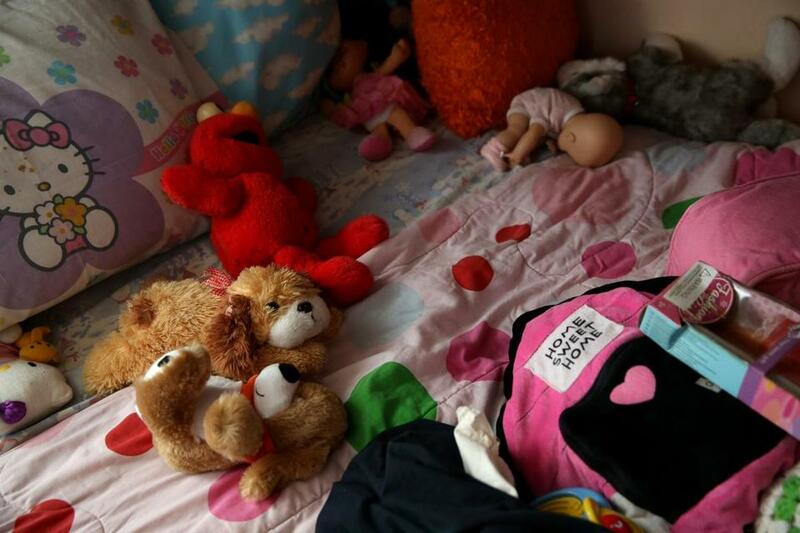 Stuffed animals lay on her daughter’s bed at Cynthia’s home. The DCF took her children into custody over a variety of concerns, some involving the children’s father. Cynthia’s entanglement with DCF began when stakes were high for the department, too, as ratcheting demand for child protective services stretched the system thin. In late 2013 — as concerns started to swirl about the well-being of Cynthia’s oldest child — DCF was in crisis. A 5-year-old boy had gone missing in Fitchburg. His DCF caseworker, it turned out, had not checked on him for months. Last seen alive in September that year, Jeremiah Oliver was discovered dead the following April, his body crammed into a suitcase by the side of a highway. In the midst of the public outrage that followed, prevailing attitudes swung sharply toward a more interventionist response. Statewide, the number of petitions to remove children from their homes jumped almost 30 percent in two years. The system strained to add more caseworkers, foster homes, and lawyers. Eventually, hundreds more workers were hired. But cases lagged, and children were kept from their parents longer. A spokeswoman for the department declined to comment on Cynthia’s or any individual child protection case, citing state and federal laws that protect confidentiality. In every case, DCF officials say, they strive for balance between a parent’s fundamental right to raise their child and the state’s duty to keep children safe. The goal at the start is always reunification of families, and most of the time, that is the final result. But while the law requires the state to make reasonable efforts to help parents get their children back, parent advocates say that in practice those efforts vary widely. Neither DCF nor the courts maintain a separate, specific tally of the number of times each year judges terminate a parent’s rights for good. Those decisions, sometimes described as the child-welfare equivalent of the death penalty, float within the larger pool of child protection cases. For every parent who loses a child — even those whose personal lapses defy comprehension — the separation process can be devastating. To Cynthia, the process felt repetitive and dispiriting. Her case was reassigned frequently, she said — sometimes because she asked for a new caseworker, sometimes by the state — and she questioned if the youngest, most inexperienced workers fully grasped the day-to-day demands of parenting. She says she did the things they asked, attending groups and classes on domestic violence, parenting, and trauma, yet they sometimes assigned the same tasks again. Still, she kept on tackling the checklists of things she had to do better. She went into therapy, and most essentially, she avoided her ex. In the spring of 2015, encouraged by her progress, the state returned two of her children to Cynthia. It was the reunion she had dreamed of for a year. She vowed things would be different, her parenting unassailable. She tacked a blue poster board to her kitchen wall, the children’s names on one side and the house rules on the other: no throwing toys; no hitting; no screaming. Four months later, her children were taken again. Cynthia believes their removal was triggered by a chance stop she made at a gas station in Salem, where they ran into the children’s father by accident. As Cynthia remembers it, her daughter ran to him. He gave her $20. The girl later told her therapist about the encounter, Cynthia said. She suspects the therapist told DCF, and that the agency assumed the worst. The removal of the children this time, on July 3, 2015, was etched into her brain, though she did not know until much later that it would be their last time at home together. The unexpected knock came first, then a flash of fear. Cynthia says her oldest daughter pleaded to stay, crying and screaming as the caseworkers pulled her away. In later state reports Cynthia shared with the Globe, there is no mention of the gas station. The documents say the children were removed again because of “significant” clutter in the home, and because Cynthia was “overwhelmed and resistant to services.” Cynthia says she was neither. Alone again in the silence after the door closed and the children were gone, she thought of the pay phone in Swampscott, and her own mother’s promise, long ago, to bring her home. She vowed to fight, like her mother had, and told herself the emptiness in the apartment would not last. The law limits how long children can remain in limbo between home and state control. One reason is rooted in a sad reality: The older children grow, the slimmer their chance of adoption. With some exceptions, once a child has spent 15 of the previous 22 months in protective care, the state must file to terminate their parents’ legal rights. At the end of 2015, citing their long stays in foster care, the state changed its goal for Cynthia’s children from family reunification to adoption. The move seemed to startle her into action. Soon after, early in 2016, she went to court and obtained a restraining order against her children’s father, a protection she says was denied her the first time she sought one. It was a decisive step toward separation, a sign of resolve. But it came too late. She was already pregnant with another child by him. It had happened after the children were taken this last time, she said. She had been grieving, she later explained, and longing for a substitute for her missing family. Her ex was “the last consistent thing I had.” He had promised her, again, that he would change. She gave birth to the baby, her fifth, in a friend’s apartment in spring 2016. The state swiftly moved the child to foster care. Her pining for her absent children grew. She sought comfort once more in the same man — the man who was the reason her children had been taken — and she became pregnant yet again. The baby, her sixth, was born at home, in a bathtub, in 2017. A report of neglect was made to DCF the same day, for her lack of prenatal care and the home birth, according to the documents she shared; the department immediately took that baby, too. By then, Cynthia says, she understood her critical misjudgment. Everything she’d learned in the past five years — the insight forged from pain and her state-mandated classes — coalesced into cutting hindsight and regret. She believed in her heart that she had changed. But she could not go back and undo what she had done. Cynthia drove to a supervised visit with her daughter. On the morning last August when she drove to Chelsea to see her oldest daughter, Cynthia arrived early at the DCF office and sat down with her load of backpacks in the waiting room. Her daughter came in late, a caseworker beside her. When she saw her mother, a smile lit up her face. She walked to Cynthia and wrapped her arms around her. “I love you,” the girl whispered back, her face serene as her mother rocked her gently. “We’re in 103,” the caseworker announced. Cynthia could not believe it had been nearly five years. Five years of monthly visits from state caseworkers. Five years of attempts at self-betterment. Now they wanted her to see her therapist more often. Cynthia said she didn’t need to, and could not afford to take more time off work. The visit with her daughter was a respite, a narrow interval reminding her what all of her striving was for. They talked about summer camp and the start of school. Cynthia gave her the backpack, some pens and pencils, a dictionary, a thesaurus. Together, they called Cynthia’s mother to say hello. Then Cynthia escorted her daughter to the bathroom. She stood waiting just outside the door — a mother in charge again, if only for a moment. “Wash your hands, please,” she called through the door. Sometimes in the past, leaving them after a visit, she had whispered a promise to her children: “Mommy’s not done fighting.” But the power of the vow had dimmed with repetition. This time, she could not bring herself to say it. Summer turned to fall. There were no more visits. One night in October, Cynthia was on a break at work when one of her co-workers approached. “I saw your kids on TV,” the woman said. Cynthia felt sick. “What do you mean?” she asked. “On Wednesday’s Child,” the woman said. Cynthia stared at the words on the screen. She made it through Christmas, buying presents she would not see them open. She held onto hope for her last, youngest child, taken by the state but still legally in her grasp. Then last week, Cynthia says, her court-appointed lawyer told her the state had offered a deal: If she agreed to give up her rights to the last child without a trial, she would be granted one visit a year. She says her lawyer told her she would likely lose a trial, and never see the child again. She was given one day to decide. She thought about the baby, just beginning to walk and talk, who had never lived with her and barely knew her. She cried, and tried to figure out what a good mother would do. Then she went to court and signed the papers. In her darkest moments, in the children’s silent bedrooms, she told herself that this was not forever. Her first-born girl was growing up. She knew how to use public transportation. “When she’s old enough to venture out on her own, she will find her way back to me,” Cynthia thought. If she closed her eyes, she could almost see it: her daughter, willowy, determined, boarding the train that would finally bring her home.